A Pennsylvania State University research project is exploring the possibility of using 3D printing and interactive technology to teach middle school students about the human brain. Researchers in the Brain3M project, funded by the Penn State Social Science Research Institute, have come up with a tailored online learning platform that allows students to go through a series of virtual 3D structure models and descriptions of the brain along with photos and diagrams that illustrate the complex concepts concerning how the human brain works. 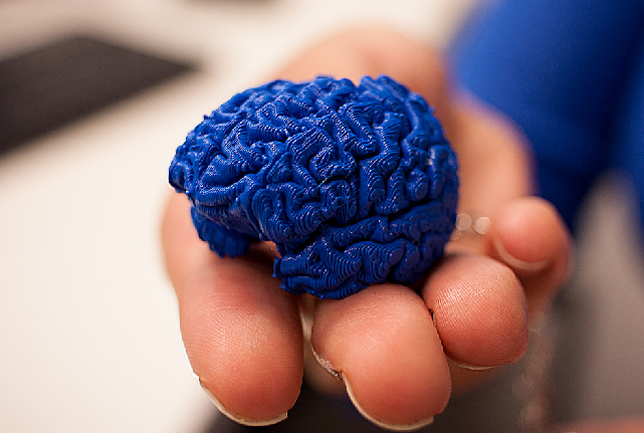 Students in the Brain3M program each receive their own 3D printed model of the human brain so they can closely examine it themselves. Likewise, students in the program each receive their own 3D printed model of the human brain so they can closely examine it themselves. "The students can click on any parts of the brain in any order they want, so we're really letting them make their own decisions about their learning," said Jennifer Legault, a graduate student at Penn State's College of Information Sciences and Technology. "The kids seemed to like that they could take control of their own learning experience and go at their own pace." In order to test the effectiveness of the Brain 3M project (which stands for mobile devices, magnetic resonance imaging and 3D models), researchers took pilot programs to the Young Scholars of Central Pennsylvania Charter School and the Science-U summer camp that is held annually on the Penn State campus for middle school students. Participants were taught two different lessons involving brain science, one with the interactive Brain3M website and the other with a PowerPoint presentation. Although the sample sizes of the groups were too small to yet draw any substantial conclusions, researchers indicated that students were more excited and engaged by the Brain3M platform. All students received the 3D models of the brain on keychains as souvenirs. "More than 80 percent of the participants said they would want to use this website again to learn about the brain," Legault said.